In May 2016, Sandy Sohcot, representing The World As It Could Be Human Rights Education Program (TWAICB), was the featured presenter at the California Teachers Association ALCOSTA (Alameda/Contra Costa County) Service Center Council Ethnic Minority & Human Rights Reception. Magret (pronounced like Margaret) Nunes attended the ALCOSTA Reception. 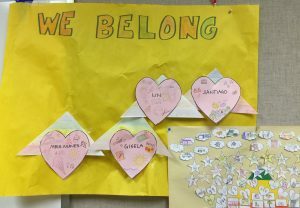 As a teacher of English to English learners at John Swett Public High School in Crockett, CA, she described how she incorporated teaching about the UDHR as part of her curriculum. We are pleased to present this narrative and hope Ms. Nunes’ work inspires others. Magret (pronounced like Margaret) explained that her English Learners class comprised an average of 10 students in grades 9-12, from countries including China, Dominican Republic, El Salvador, Mexico and Peru, with different levels of language competency. The class size changed through the year as new students arrived and some students left. Magret began the unit by reviewing the 30 Articles of the UDHR. Next, she introduced the students to Abraham Maslow’s Hierarchy of Needs. (Here's more about how TWAICB Is Within Reach Rite of Passage Program included Maslow’s Hierarchy, which includes a diagram of the Needs pyramid.) With this review, Magret included teaching vocabulary, and helping the students understand the meaning of each level of need depicted. The students created shapes to depict what each pyramid level represented. The next phase involved deeper teaching of the UDHR, which included: History of the UDHR Review of each UDHR Article, with students writing poems and/or haikus about one or more Articles Connecting the Articles to each cultural month, including American Indian Heritage Month and the Hispanic Heritage month Connecting the Articles to current events, including issues related to the Dakota Pipeline Connecting the Articles back to each level of Maslow’s pyramid Students gained a deeper understanding of their rights, and were able to apply both the learned vocabulary and UDHR information to other assignments, such as: Writing an essay to the question “Who am I?” Reading John Steinbeck’s “Of Mice and Men,” then discussing different types of discrimination depicted and connecting different incidents to UDHR Articles. Magret described the culminating class project that took place during the last week of the semester: The students collaborated in English to come up with a visual representation of the UDHR. The result was five 36” x 24” panels depicting the impact of knowing the UDHR, where the starting left-hand panel depicted stormy skies amid turmoil, moving to the right showing the UDHR as the chain flowing across the images of turmoil, ending with the chain breaking into hearts, peace signs, and musical signs around the earth. The panels will be displayed in the District Office. [gallery ids=2257,2261,2256,2255,2258,2259] Based on her experience, Magret sees teaching about the UDHR as vital for everyone, and as a valuable foundation for all students, helping to connect what they are learning to current issues affecting human lives.